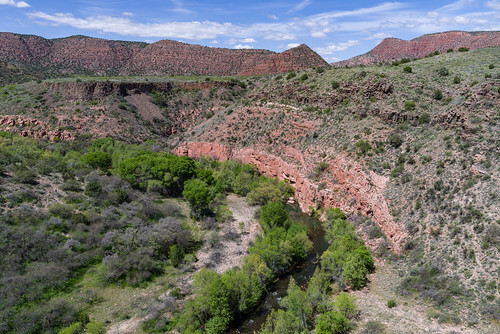 The Verde River is one of Arizona's only two Wild and Scenic Rivers, yet it remains relatively undiscovered as a recreational resource. That doesn't mean this clear desert stream has little to offer. It's an excellent place to fish for a number of species including trout, which the Arizona Game and Fish Department has begun stocking on a put and take basis. The Verde is also becoming more and more popular for recreational boating. Some stretches provide scenic canoeing among long pools and manageable riffles. Other sections become exciting whitewater runs during the spring snowmelt or after late summer thunderstorms. Hover mouse over image below to display slideshow controls. See Verde Wild & Scenic River photo album on Flickr. There are new restrictions regarding fires (fire pan required) and portable toilets for users of the Verde Wild & Scenic River Area in Coconino, Tonto and Prescott National Forests - see the Forest Order and Map. Special Note: The Verde River hasn’t seen a large scale scrubbing flood since 1993. Although it is a river, it often resembles “creek boating” with water levels and vegetation conditions varying by season and year. Vegetation may have choked some channels. Forest Service advises that boaters plan for longer travel times to accommodate scouting and safe passage. Location: 50 miles south of Flagstaff on paved and gravel roads. Elevation is a warm 3,000 feet. Access: Drive south 50 miles from Flagstaff on I-17 to Camp Verde and turn east on State Highway 260 (the General Crook Highway). Major river access points are at the White Bridge where State Highway 260 crosses the river east of Camp Verde, at Beasley Flats via FR 574 and FR 529, and near the Childs Power Plant via FR 708 and FR 502. The route into Childs is steep and winding. It can become very soft and slippery when wet. Verde River Coridor Map: This map covers from Tapco to Beasley Flat, and Hwy 89A to Sedona. It shows river access points, parks, campgrounds, and major roads in the area. Facilities: Developed Day Use Facilities include vault toilets, picnic tables and primitive boat ramps at various sites. Skidmore Drive Access, Prairie Lane Access, Bignotti River Access, White Bridge River Access, Clear Creek River Access, Beasley Flat River Access. Hiking and biking trails. The Verde River hasn’t seen a large scale scrubbing flood since 1993 . Although it is a river, it often resembles “creek boating” with water levels and vegetation conditions varying by season and year. No toilets at Clear Creek, Prairie Lane, or Skidmore River Access Points. Below Verde Falls, 1.5 miles of river bank are closed to walking or fishing from December 1 to June 15 to avoid disturbing nesting bald eagles. Water level varies with seasons. (See links at "Overview/Background" in the right column). Whitewater can be dangerous and cold, wet suits suggested. Trout are stocked during cool water times of the year only. Childs Dispersed Camping Area is an undeveloped and very remote area on the Verde. It's an excellent place to fish for a number of species including trout, which the Arizona Game and Fish Department has begun stocking on a put and take basis. The Verde is becoming more and more popular for recreational boating. Some stretches provide scenic canoeing among long pools and manageable riffles. Other sections become exciting whitewater runs during the spring snowmelt or after late summer thunderstorms.